oz.Typewriter: So What Did Happen on June 23, 1868? Typewriter Day, being celebrated worldwide today with Type Unconventional, marks the 146th anniversary of the first patent (#79265) being granted to Christopher Latham Sholes, Carlos Glidden and Samuel Willard Soulé for what would become the Sholes & Glidden typewriter. It is regarded as the dawning of the age of the typewriter. 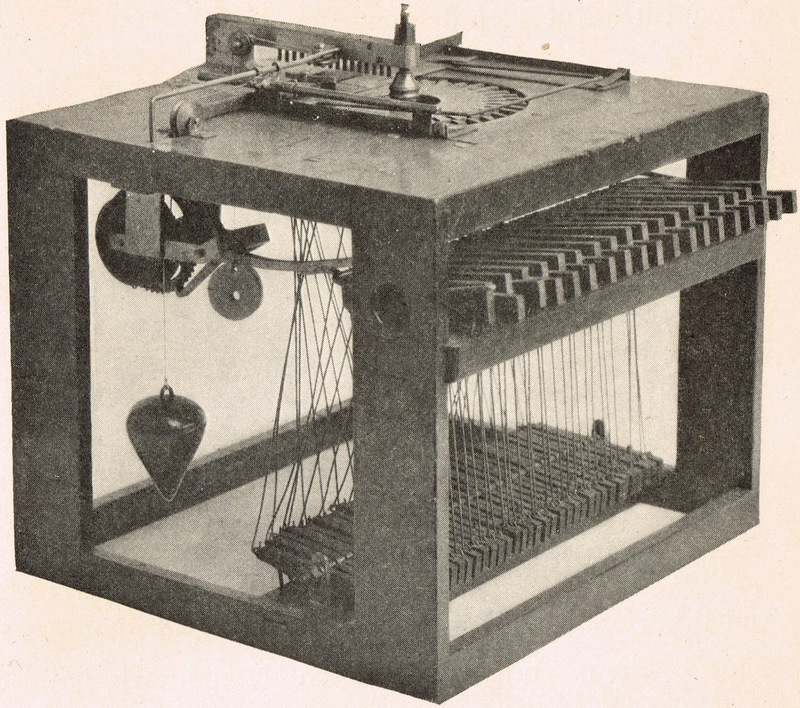 The so-called "improved" model which James Densmore took with him to the US Patent Office in Washington DC on May 1, 1868. The patent for this design was granted on June 23, before the patent on the original design, applied for by Sholes, Glidden and Soulé on October 11, 1867, and issued on July 14, 1868. But what exactly did occur on June 23, 1868? Well, actually, not a lot ... certainly not a lot in terms of the history of the development of the typewriter. 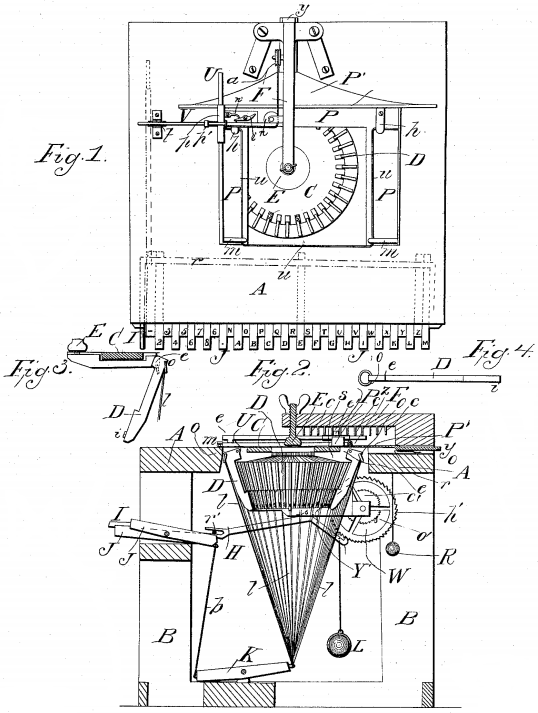 This patent, however, was not issued until July 14, 1868, three weeks after the patent for the later, so-called "improved" machine. Dodge, by the way, was also employed by Sholes to patent his machine for printing numbers (#64375) in 1867, and the previous year Sholes and Soulé employed Dodge's father, William Castle Dodge (1827-1914), as their patent attorney for an earlier version of this machine (#59654). Philip Dodge went on to become a patent counsel for E. Remington & Sons and it was he who secured the Byron Alden Brooks patent for the shift device first used on the Remington 2 in 1878. Starting in late 1891, Dodge served 37 years as general manager and president of the Mergenthaler Linotype Company. Densmore immediately replied that he was keen to negotiate for an interest in the typewriter venture. 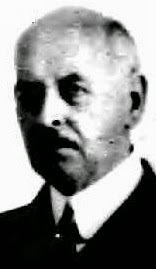 At the time Densmore was earning $100-$150 a month as attorney for the Corry Machine Company, which made farm implements in Pennsylvania, but was owed more than $10,000 in debts. 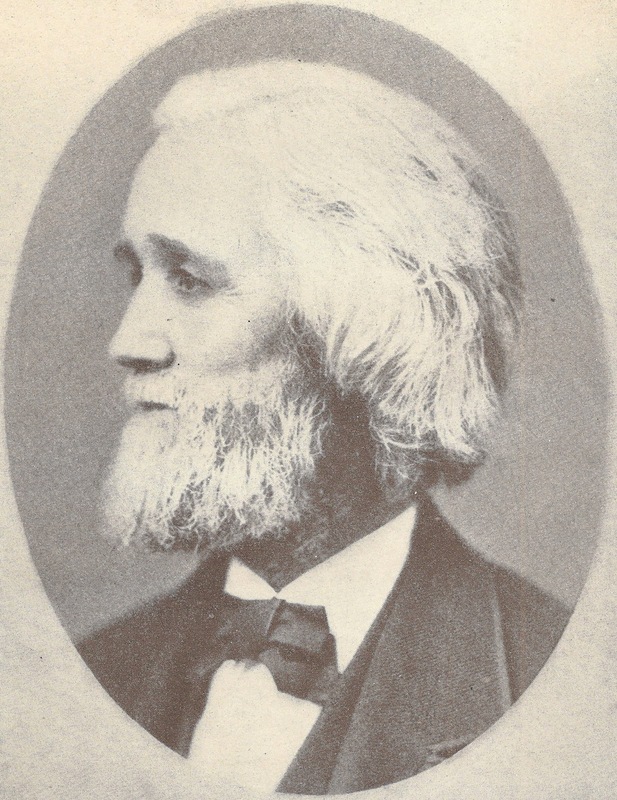 In November 1867, Densmore was assigned a one-fourth share in the typewriter enterprise, for which he paid the first three stakeholders, Sholes, Glidden and Soulé, $200 each, while also agreeing to finance the manufacture of the typewriter. 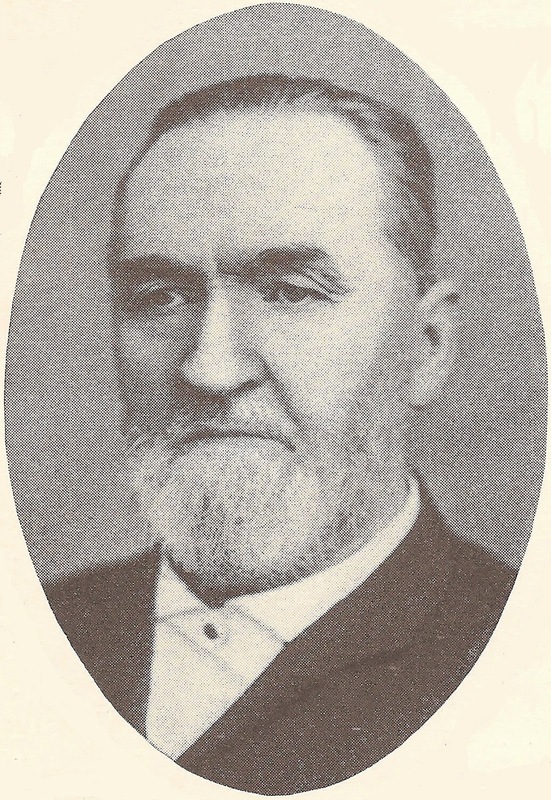 Densmore remained in Meadville while on January 24, 1868, his son Darsa James Densmore was born to him and his wife Adella Ryan Barron Densmore. In March he travelled by train to Milwaukee, where he saw the typewriter for the first time. Densmore didn't like what he found. He thought the machine too cumbersome and crude, and instantly started to fear for his initial $600 investment and his undertaking to manufacture the typewriter. But rather than walk away from his commitment, Densmore stayed on in Milwaukee to take command of the project and to oversee the design changes he demanded, much to the chagrin of Sholes, Glidden and Soulé. Soulé was primarily responsible for constructing a new model. The wires that had connected the key levers to the typebars on the first machine were removed. In their place the levers stuck the typebars from underneath and "kicked" the typebars up through the centre opening. Densmore referred to this as the "direct action" or "kick up" model and much preferred it to the earlier attempt. Given Densmore's clear bias, it was the second model which was able to secure the first patent, a move which resulted in causing utter and complete confusion for all typewriter historians for the best part of the next century. Indeed, it was Densmore who personally drew up the specifications for it. 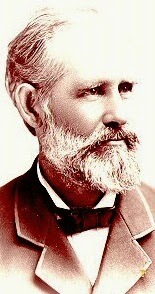 He had some knowledge with patents law and Patent Office procedure. Though a self-made lawyer with little experience as a practicing attorney, in 1866 he had handled four patent applications while in the oil shipping business. With the specifications for these four wooden tankcar patents, Densmore had set out to be inclusive so as to forestall competition, but failed to make them sufficiently broad. With the typewriter, he yet again tried to be broad. 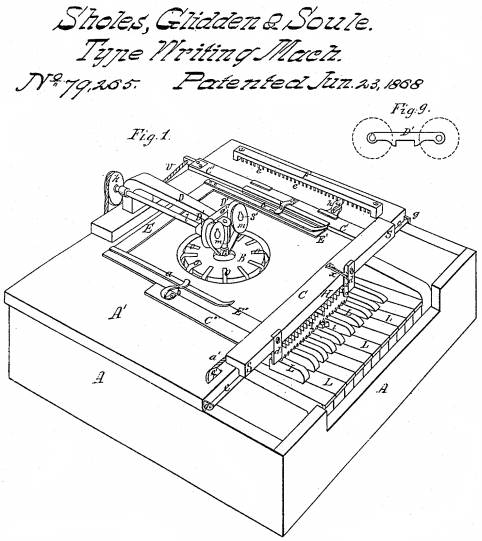 Densmore took a model of the typewriter, along with the specifications and drawings, to the US Patent Office in Washington DC on May 1, 1868. On his return to Milwaukee in July 1868, Densmore decided the time was right to manufacture the typewriter. But he felt Milwaukee lacked the necessary facilities, so he and Soulé (as lead engineer on the "kick up" version) went to Chicago. 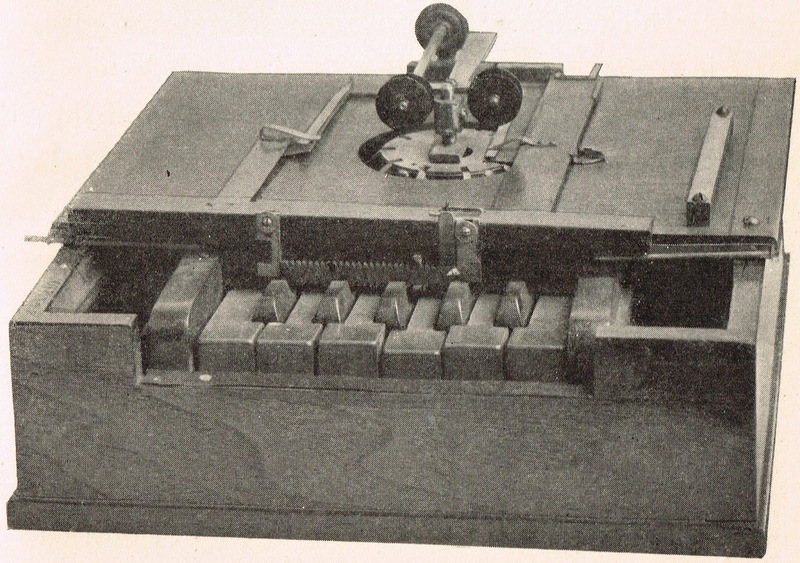 There 15 typewriter prototypes - built for a total cost of $400 - were tested by Edward Payson Porter (1834-1916), proprietor of Porter's National Telegraph College in Room 9, 126 Washington Street (Court House Square). It certainly was an interesting early history for the typewriter.